Baoshan’s geographic positioning—on the tip of northern Shanghai, where the Changjiang and Huangpu Rivers meet—makes it an exceptional railway and port transport centre. It is now China’s largest district for container van manufacturing, storing and transportation. 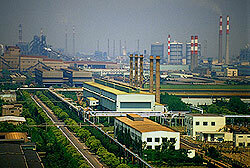 The country’s largest steel company is also in Baoshan. In Baoshan, Luodian is one of nine new towns sponsored by the Shanghai city government to relieve city-centre congestion. It’s a self-contained area, complete with all conveniences and amenities. Shanghai University’s main campus is in Baoshan.